I think if you have mandatory carbon caps combined with a trading system, much like we did with sulfur, and if you have a tax-incentive program for investing in the solutions, that there’s a package there that’s very, very good. And frankly, it’s something I would strongly support….The caps, with a trading system, on sulfur has worked brilliantly because it has brought free-market attitudes, entrepreneurship and technology and made it very profitable to have less sulfur. 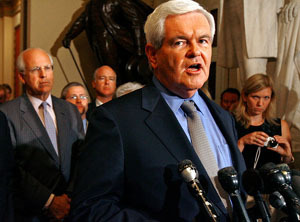 Well, that’s Newt for you: he dumps policy positions as quickly as he dumps wives. But it also goes to show how fleeting conservative support for “market-oriented solutions” like cap-and trade is. A lot of the liberal enthusiasm for cap-and-trade over the past decade has been based on the idea that it might be more acceptable to conservatives than a straight tax, but obviously that hasn’t turned out to be the case. Basically, they just don’t want to do anything, full stop.